I cannot say enough good things about Tooth & Honey’s quality products, great customer service, and commitment to supporting animal shelters and rescue! 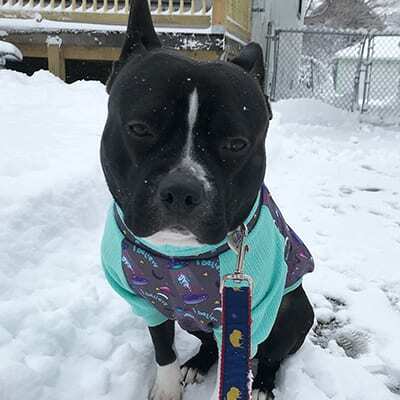 I volunteer with the dogs at BARCS animal shelter in Baltimore, and was looking for some cozy gear to keep the shelter pups warm when I take them for sleepovers or outings out in the community. I initially discovered Tooth & Honey several years ago via a social media post in which T&H was taking nominations of shelters and rescues to donate sweaters to. 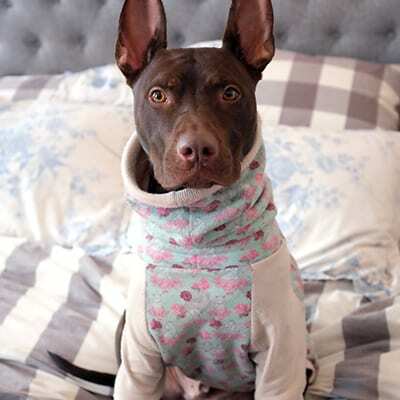 I fell in love with the cute prints and styles, and it wasn’t long before I had order a few to use with the shelter pups. My initial Etsy order of sweaters arrived in the mail very quickly, and I couldn’t wait for the next chilly day to test them out with the pups! 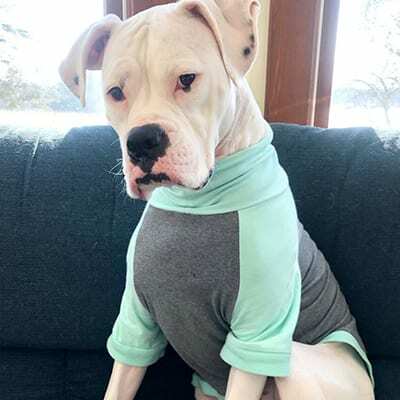 Not only do Tooth & Honey sweaters and PJs fit the normally hard to fit pit-mixes perfectly, but they are super stylish and a conversation starter. 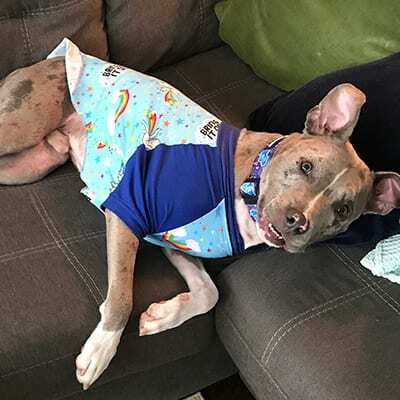 People can’t help but smile and ask to say “hi” to a pup they see wearing a T&H sweater 🙂 They are also fabulous accessories to help jazz up the pups’ profile pictures on BARCS’ websites, and they definitely help them get adopted faster! Honestly, it’s probably for the best that past Soph didn’t know that what started as buying “just one color” of a ridiculously cute onesie ducky pajama would escalate into an obsession extremely quickly. My dog Cashew now has a full blown Tooth & Honey wardrobe, and to be honest, I regret nothing. What is so special about Tooth & Honey products is that they are equal parts fun and silly as they are wildly useful and practical. I have been stopped on the street, yelled to from cars, bombarded in coffee shops, and followed down the street by people who want to know where I got my dog’s sweater. I have literally been offered money for the coat off of my dog’s back. When people spot the striking patterns on his coats, they can’t help but smile and strike up a conversation with me! 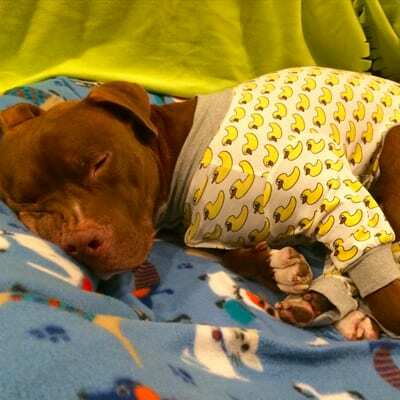 Ally’s personal mission to serve as a Pit Bull advocate means everything to me. Not only does she speak out for them, but she donates countless animal shelters across the United States with her products. She asks for nothing in return. She has sent me multiple care packages filled with products that I use to dress up and photograph dozens of homeless animals. Tooth & Honey shirts, sweaters, pajamas, collars, leashes, and bandanas are something that my shelter’s dogs wear on a regular basis. I do this in the hopes that the people who see the images I create will experience what Cashew and I experience every day: a little bit of tenderness fueled by the undeniable cuteness of an outfit. Every little thing that helps highlight how uniquely perfect the dogs who find themselves in shelters counts. I will never stop supporting a company that believes in speaking up for the voiceless and giving back as much as they can. Plus, let’s be real, Cashew looks too good in the clothes for me to ever stop buying them. Can’t believe I didn’t know about Tooth and Honey until end of 2017. It’s hard to find clothes to fit my Staffy & Boxer mix pups, but Tooth and Honey fits them perfectly!! Have loved everything I’ve bought from Tooth and Honey so far and I have a lengthy wishlist of clothes I want to get next. We love the bandanas. Not only do they make Carlo look good, they are lightweight and actually stay on. The fun patterns are the best – one for every occasion, like Saturday night pizza parties. The pullover was WELL worth every cent. Even though we live in Buffalo, N.Y. , Carlo is not a fan of the cold. His previous winter jacket was too large in some areas and too tight in others – plus, he constantly peed on it. (Eye roll.) Not anymore! This fits like a glove. Because he’s a bully and black, people often think he looks threatening. The pullover really helps his personality shine. He loves wearing it and I love letting him strut his stuff. Thank you Tooth and Honey for advocating for bully breeds! I will be making some purchases for his first Gotcha Day in May. Ruby has struggled with skin issues since our move to El Paso in 2014. The dry climate made her itch constantly and sometimes to the point where she would scratch her skin raw. Even with diet changes and medications, she still struggled with sensitive skin. I found it hard to find shirts/sweaters to cover her skin because of her wide “bully” chest. Then I found Tooth and Honey and bought our first pair of PJs that cover even more than a shirt would. This protected her skin from her scratching, fit her perfectly, stayed on and allowed areas that weren’t healing to completely heal! I am so happy with the quality of the product (after multiple washes -no issues) and we can’t wait to buy more Tooth and Honey Products (we also love her fleece sweatshirts!). Above all else Ruby looks adorable! Coraline and Zsa have tried everything from anti depressants to CBD treats. Nothing seemed to ease their anxiety, until we put them in a Tooth and Honey sweater. Not only do they make my girls feel protected and safe, but they are soft and comfy as well. I cannot express how much we love these Tooth and Honey sweaters. Having products that are tailor made to fit my bully breed girls is a game changer! As you can see Mom and I are in love with all of Tooth and Honeys clothing! Whether it is lounging around the house, begging for treats, walkin’ around my hood or pretending I am a unicorn Tooth and Honey has me covered!! The quality is top notch and every thing we have ordered has fit perfectly! The measuring guide is spot on and we never have to worry about the fit! We love that Tooth and Honey is designed specifically for us big chested dogs! Customer service is beyond pawtastic! Anytime we have messaged Tooth and Honey they have responded in lightning flash speed and always with love!! Our favorite part about Tooth and Honey is what they do for the bully breed! They are first and foremost advocates for the underdog. 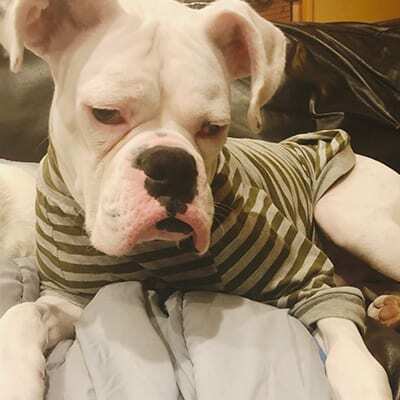 They spotlight dogs who need adopting or some extra love on their IG account and stories and continuously donate their merchandise to rescue groups in need. Tooth and Honey is that rare breed of a company that talks the talk and walks the walk! We love Tooth & Honey! We first fell in love with the fleece sweaters back in January 2017. It was our first winter in Wisconsin (we moved from Georgia), and Gouda was having a hard time with the cold. It was important to us that we find something that would keep Gouda warm and was high quality – and bonus if the shirts were cute. We found all of that and more with Tooth & Honey. After the fleece sweaters came collars, harnesses, and leashes with unicorns, rainbows, hippos and snacks on them. Then came the unicorn and rainbow raglan, the ducky pajamas, color block sweatshirt, and more unicorns, rainbows and hippos on sweaters. Not only do the clothes and accessories keep him warm, safe and secure – they are also INCREDIBLY cute. Because Gouda appears to be a pit bull type dog, people are sometimes leery of him when we are out in public due to their negative preconceptions (thanks in large part to the media and BSL). 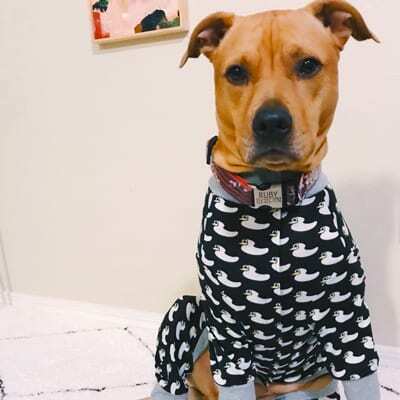 His Tooth & Honey clothing and accessories have broken the ice and have lead numerous people to re-think their preconceived notions of what pit bull type dogs are like. We were at a local dog-friendly bar not too long ago, and Gouda was wearing his rainbow unicorns raglan. A gentleman noticed his shirt first and complimented him on how cute it was. He then tentatively reached out to pet Gouda, who wiggled and leaned up against him for more scratches. After this interaction, the gentleman alluded to the negative stereotypes of pit bull type dogs in the media and noted that Gouda was the exact opposite of those stereotypes. It lead to a conversation about making judgments without being fully informed. We like to think that through this one interaction, Gouda (and his Tooth & Honey shirt & collar) changed this man’s perception of pit bull type dogs – and Gouda made a new friend in the process. 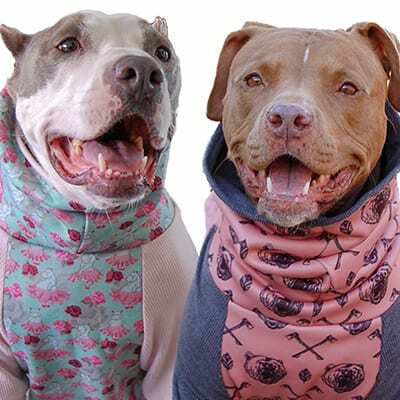 Thank you Ally and Tooth & Honey for making clothes and accessories that fit bully breed dogs, are high quality and well-made, and that truly capture the sweet, adorable and loving nature of these often misunderstood dogs.